← My Weird Indy Publishing Project: Recovery from Crisis! 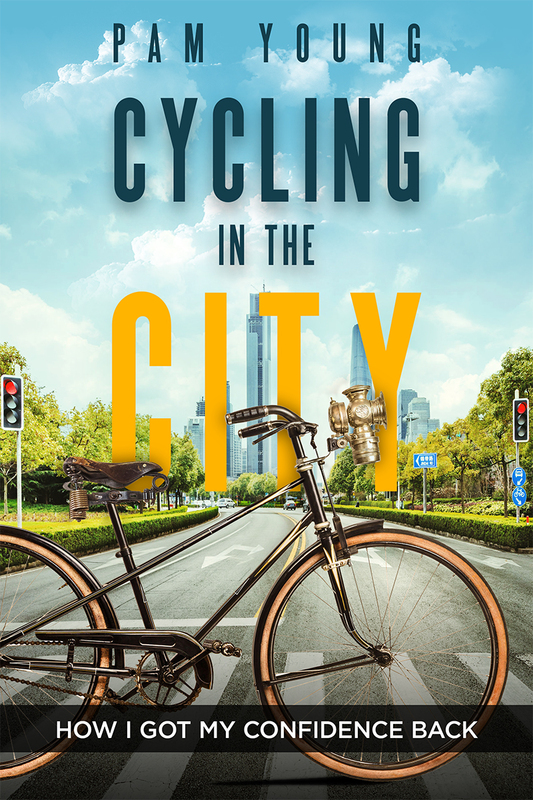 Book 2: CYCLING in the CITY was finished March 2 and sent to be formatted for eBook and print by the same man who did BURNOUT — How A Desert Lizard Restored My Faith, Glenn Sarco. CYCLING is the story about the first several month’s breakaway from the career job with one paycheck and no plans. After the first few weeks of getting to know the Sacramento area by car with social trips to San Francisco, I decided to go for a bicycle ride … and had a bizarre experience. I was devastated! I couldn’t do it! I couldn’t ride my bicycle! So I reached for something more familiar (learning) and holed up in the garage, where it was cooler, to study A Course in Miracles (ACiM), the book I had brought with me to continue learning about forgiveness. I wanted to heal the giant chasm between me and my friend who had become My Nemesis in my previous year at the college, and ACiM came highly recommended. CYCLING in the CITY is the story about how I got my confidence and self-esteem back from the extreme burnout of the last year teaching in Purgatory (the stuff of BURNOUT — How A Desert Lizard Restored My Faith). Part One tells how cycling became my tool for change when, after my first miserable “ride,” I took myself on as a client, applying special education techniques to overcome residual fear about my breakaway from a tenured position. Part Two addresses the process of making changes and why those New Year’s Resolutions don’t stick. It explains why making changes is so difficult and how you can set yourself up for success instead of failure — even with those tough behaviors like substance abuse: smoking, alcohol and drugs. And it includes the SECRET for success! I can’t wait to write that book! But it will have to wait a while because Life stepped in just as I was finishing Book 2. But the same day we had the renter’s walk-through and I wrote the check for the his deposit refund, I realized what Life had given me! Having an empty apartment with rent paid for the month was a huge opportunity, just too good to pass up. It is time enough not only for routine maintenance, but for a big project like ripping out the old kitchen and putting in a new one. Not that I’ll be doing the work. But I’m the one who keeps records of what happens in each apartment and makes the list of projects for bids. My job includes determining which project is most important, and assessing the savings to see which one we could actually do. And it includes meeting with the guys before, during and after the job is completed. Just because someone else is doing the actual labor does not mean the one who hired them isn’t involved. It’s like being on call all day as long as the project is happening, whether in planning or execution stage. Even though I’ve done this for years, the past few days have been difficult, adjusting again to that role. Because I’m finally writing! I waited a lifetime to do what I love and am very reluctant to give it up — even for a brief time. I’m finally in a position where I can write all day, every day, if I choose to do so. My heart clings to the joy of writing without interruption while my Inner Adult says, This remodeling project is a good thing. You can do what you did before writing: clean your apartment, do those piles of laundry, and shred that box of paper. But she’s right. When I’m writing I tend to blow off routine things like vacuuming. And it’s absolutely true that I bought enough underwear to last three weeks so I could skip doing laundry at the laundromat while writing. So that’s where my attention will be for the next several weeks while I wait to see the formatting Glenn did for my new book. I’ll spend my days being available for the contractor (to fetch or talk or meet) while I’m catching up with tending my own apartment. And my Inner Child already feels the love of being cared for properly even with yesterday’s first day of serious cleaning in weeks! Join me next week for “Being Where You Are” — as an Indy author or any other role in life. This entry was posted in eBooks and tagged be where you are, indie author, indie publishing, personal journey, self-publishing, spiritual journey. Bookmark the permalink. Yes sir! And that’s the big secret for being happy. Hi, Rod. Thanks for stopping by.